Three very similar looking orchids, Orchis conica, Orchis lactea and Orchis tridentata have recently been moved from the Orchis genus to the Neotinea genus where they join the former Orchis intacta which is now called Neotinea maculata. Despite their large geographical range, many authorities have long suspected that the morphological similarities between O. conica, O. lactea and O. tridentata indicate a very close relationship, and this has now been confirmed by molecular study. These orchids are now sometimes simply referred to by the synonyms Neotinea conica, Neotinea lactea and Neotinea tridentata. The common name of this orchid refers to the colour of the flowers, which are a pale milky colour although the lip is densely marked with dark dots and streaks. Neotinea lactea is a small plant growing only to around 25cm tall. It has 3-5 erect basal leaves which are pale green and unmarked, and there are further small bract-like leaves sheathing the lower stem. The inflorescence is dense and the number of flowers is very variable. The flower sepals and petals are marked with dark green veins and form a hood above the lip. The lip is deeply lobed, usually a creamy colour and marked with dark pink spots. The central lobe is convex and bent backwards. 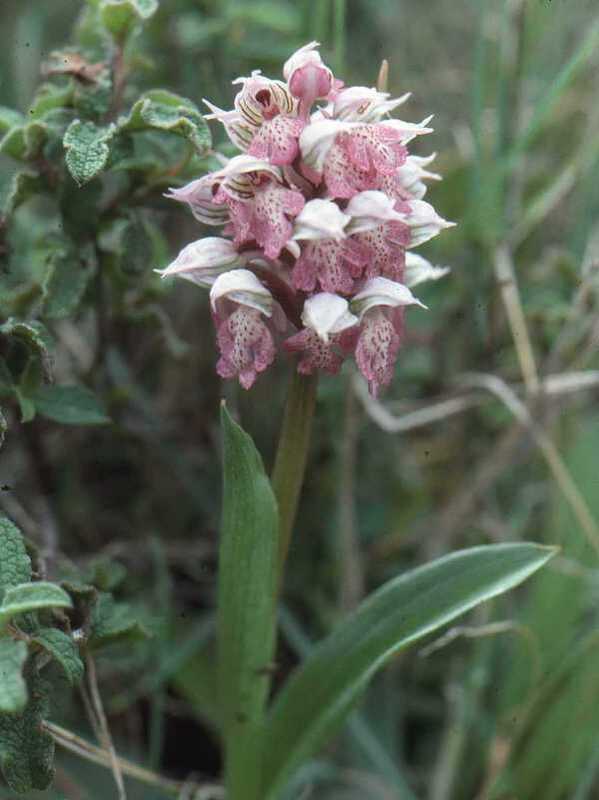 There is some debate about the extent of this orchid's range in the Mediterranean due to confusion with the similar orchids (mentioned above) Neotinea conica in the west and Neotinea tridentata in other parts of the range. It is recorded from France, Italy, Crete and Corsica. End of February to tbe beginning of April. The picture on this page was taken in Crete.